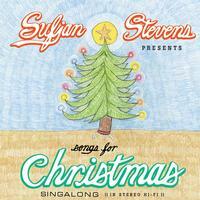 Sufjan Stevens' annual Christmas EPs released on 5 disc set! Forget the 50 States. Christmas is a bigger concept. As some of you may or may not know as a holiday tradition, Sufjan embarked on an extraordinary experiment to record an annual Christmas EP. It started in 2001, the year of Epiphanies, and continued onward (skipping only 2004), culminating into an odd and idiosyncratic catalog of music that has only existed in the Asthmatic Kitty archives (and on a number of file sharing sites). The recording process took place every December, for one week, usually at home, provoking collaborations with friends, roommates, and musical peers. Armed with a Reader’s Digest Christmas Songbook (and a mug of hot cider) Sufjan & friends concocted a musical fruit cake year after year, implementing every musical instrument they could find lying around the house: banjo, oboe, Casiotone, wood flute, a buzzy guitar, hand claps, sleigh bells, Hammond organ, and some tree tinsel. Did we mention sleigh bells? It doesn’t take much to capture that Creepy Christmas Feeling, does it? Recorded, mixed and mastered at home, the EPs themselves were often assembled in the kitchen, stapled together, and sent out with stickers and stamps to loved ones across the globe, year after year. Recording traditional favorites alongside unique originals, Sufjan has constructed an odd, impressive, and compelling collection of Christmas tunes. He was "determined to present the EPs in their original form; flaws, blemishes, mistakes and all." The box set is chock full of surprises!